Schmalz vacuum clamping technology guarantees efficient production processes on CNC machine tools in the wood, plastics, metal, glass, aeronautical, space, solar and electronics industries. 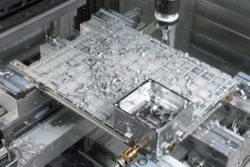 This technology is already used as original equipment on many CNC machines, and the Schmalz Innospann clamping systems can be retrofitted on existing machining centres, permitting decisive improvements in their productivity and operating costs. The possible savings which result from the shorter set-up times are enormous, and the systems pay for themselves very quickly. With the new vacuum clamping system Multi-Clamp, Schmalz offers the perfect tool for ergonomic clamping of small and medium-sized workpieces. Workpieces clamped with the Multi-Clamp can be worked on from all sides without reclamping. The lightweight construction of the Multi-Clamp guarantees a maximum degree of flexibility for simple and quick operation. The clamping system can be used on almost any flat surface and consists of the Multi-Clamp suction plate and the Multi-Base which enables to swivel and rotate the workpiece. The complete system Multi-Clamp is available with an integrated vacuum generator (pneumatic ejector) or optionally available with an external vacuum pump. TheMatrix Plate Vacuum Clamping Systemis particularly suitable for process-safe clamping of large, flat metal workpieces with smooth bottom surfaces on CNC machining centres and guarantees very short set-up times. Even components which are difficult to clamp mechanically can be clamped easily, quickly, without distortion and precisely. 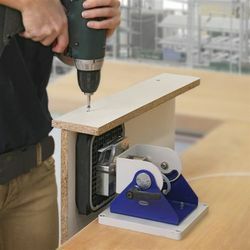 The Matrix-Plate can be secured quickly on the machine table with the aid of clamping claws or a zero-point clamping system. The modular design ensures maximum flexibility since the components are easy to handle and the various versions can be combined freely. The complexity of the workpiece geometry, the type of machining and the horizontal forces which have to be handled determine which version of the Matrix-Plate should be used. Looking for Vacuum Clamping Systems ?